What is a dental cap or dental crown? 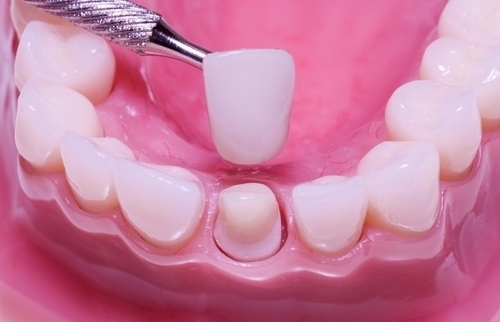 A dental crown or cap is dental restoration that covers the tooth completely. Dental Caps are given to protect the tooth structures that have compromised strength to withstand chewing forces and can fracture under load. Reasons may be many why a tooth has become weak including decay, treatments or an accident. 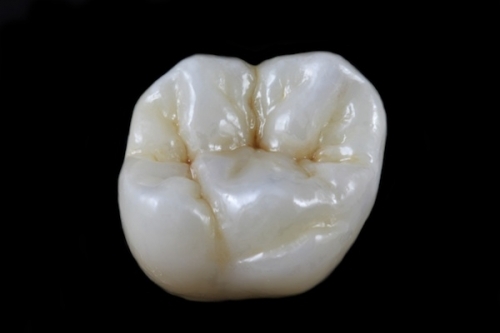 To place a crown the tooth needs to be prepared and the amount of preparation depends on the material of crown. Metallic crowns need 0.5-0.75 mm of tooth reduction whereas others might need about 1.5 mm of tooth reduction. After root canal treatment (RCT), the tooth gets dehydrated as the pulp is removed and becomes brittle. The tooth is anyway destroyed due to decay, and the treatment procedure further weakens it. . 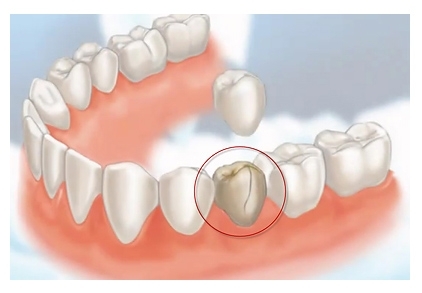 This treated tooth can fracture under chewing forces. Dental Cap (crown) is advised to prevent the fracture of the tooth. 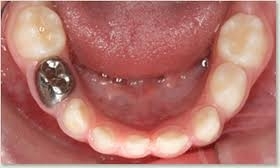 What is the procedure for placement of cap over the tooth? On the first visit, the tooth is prepared to receive a cap wherein an impression of the entire dentition is made. Then the positive replica of the teeth is obtained by pouring Plaster of Paris (dental stone) over the impression. This is sent to the lab and a cap of the required dimension and material is prepared. At the next visit, the crown will be fitted on top of the prepared tooth and the procedure is completed within a few minutes. Now the tooth is ready to serve for several more years. What are the different varieties of dental caps? The dental cap or crown can be made of different kinds of materials. Ceramic (porcelain fused to metal). What is a metal cap? 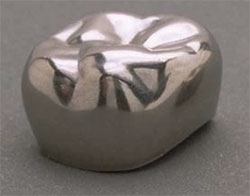 Metallic crowns can be made of base metal alloys wherein they look like steel crowns or they can be made of gold alloy. The color of these crowns does not match with that of adjacent natural teeth. Hence their usage is very limited. They can be used on teeth in the non-visible zone like lower molar area. 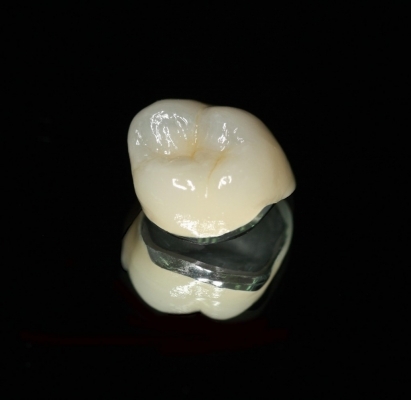 What is a Porcelain fused to metal crown (metal ceramic crown)? As they have metal as their core their aesthetic value is lower compared to an all-ceramic crown. The Metal might be seen at the gum margins of these crowns. Hence they can be a contraindication in front teeth. They can wear away the opposing natural teeth. The ceramic material may chip off exposing the underlying metal over a period of time. 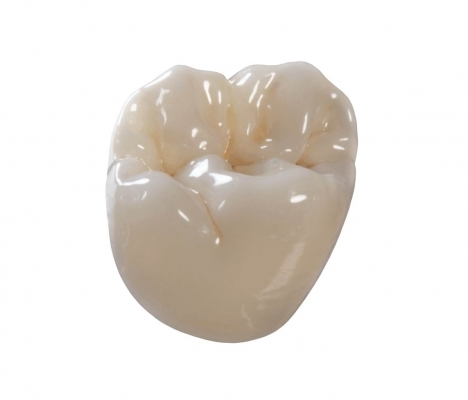 Porcelain fused to metal crowns are the most commonly used crowns across the world. They have a metal core that provides the strength required to bear chewing forces. A layer of Ceramic material is added and sintered (fused) over the metal core. These caps can be color matched with the adjacent natural teeth thus making them the most acceptable dental crowns. They have good life and are strong. They can be used both in the visible and non-visible zones of mouth. 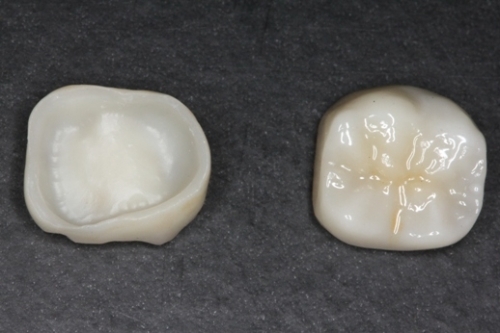 What is an All-Ceramic crown? These crowns are made only of ceramic material without the metal base. They are the most natural looking crowns and at times it might even be difficult to distinguish them from natural teeth. They have very high translucency matching that of natural teeth. Hence their aesthetic value is very high. They are the best crowns to be used to restore front teeth. They are preferred in visible zones particularly upper front teeth or lower front teeth. These crowns have lower strength thus reducing their durability. They can be used only in no stress zones like the front teeth. They tend to fracture under higher forces like chewing. These crowns are the best of the lot as they have very good strength as well as aesthetics. The color of zirconium crowns is very close to that of natural teeth. Thus they don’t look artificial. . Unlike Porcelain fused to metal crowns that are most commonly used, the underlying metal is not visible as zirconium is white in color. 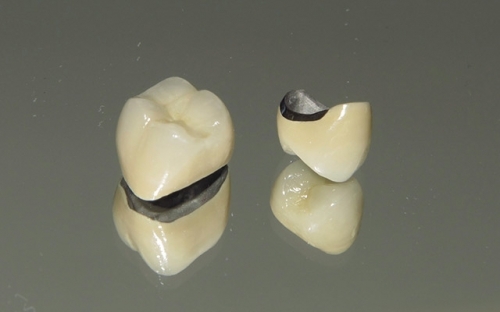 Black margins seen with conventional porcelain crowns (PFM) are not an issue of concern with zirconium crowns. They have very good strength. Hence can be used to restore both front and back teeth. Zirconium Crowns are the material of choice to replace multiple missing teeth because of their high strength. With ceramic layering for the front teeth they offer best of both worlds. Beauty, strength and durability. Many big companies like 3M, DENTSPLY are into the fabrication of these crowns. Hence they are available with warranty card valid for 5, 10, 15 years throughout the world. The major disadvantage is the cost. It is more expensive than the conventional PFM caps.